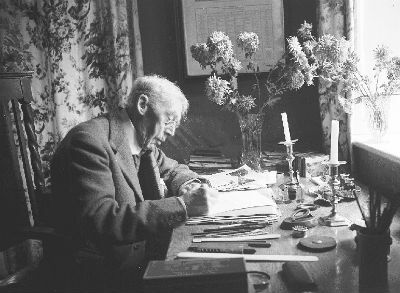 Sir Arthur Quiller-Couch was born in Bodmin in 1863 to a family of doctors, folklorists and historians formed from the union of two ancient Cornish families: the Quillers and the Couchs. He studied at Newton Abbot College, Clifton College, and finally Trinity College Oxford where he read Classics under a scholarship, obtaining a First Class Degree in Classical Moderations in 1884 and a Second Class in Greats in 1886. After matriculating, Quiller-Couch then held a position as a lecturer in Classics at Trinity and regularly contributed articles to The Speaker, before writing his first novel Dead Man’s Rock in 1887. In 1891 he settled in Fowey with his wife Louisa (nee Hicks) and his one year old boy, Bevil, and continued writing fiction including his well-known The Delectable Duchy (1893). During the 1890s the family welcomed a baby girl named Foy, and Q continued to write successfully, many critical pieces, as well as finishing Robert Louis Stevenson’s incomplete manuscript of his novel St Ives. During the early 1900s, he launched the Cornish Magazine concerned with local governing and education; published the Oxford Book of English Verse 1250 - 1900 and finished another 20 books before war broke out in 1914. He was appointed Commodore of Fowey Yacht Club in 1911, received his knighthood in 1912 for services to education, and took up the position of Fellow at Jesus College, Cambridge that he would hold for the rest of his life. He also held the King Edward VII Professor of English Literature at the University of Cambridge from 1912-44. The Quiller-Couch family suffered the tragic loss of Bevil who, having served in Flanders and France throughout the First World War, died from influenza in the 1919 pandemic. Q stopped writing fiction, publishing instead only critical pieces. He continued to be an active member of the Liberal Party, campaigning for fair education in Cornwall, became Mayor of Fowey in 1937 and remained an integral member of the Fowey community and the Cornish population until his death in 1944. 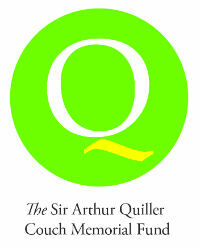 The Sir Arthur Quiller Couch Memorial Fund was set up as a charitable trust in 1945. The Fund awards small grants for research work in literary or allied subjects with a Cornish connection. Grants may be used to support travelling, obtaining transcripts or other expenses in conducting research, or to contribute to production costs, including editing, design and printing. The Committee is keen to promote diversity, excellence and creativity in Cornish literature and humanities.